ST. PETERSBURG — An old friend is back in the lineup. The Kiwanis of Gulf Beaches Miracle League, which champions baseball for the physically and mentally challenged, returned with a flourish Saturday morning. We're better for it. "This is a big day," said Matt Walker, 23, unofficial president of the league, which began 15 years ago. "Opening day is always special." Walker's wheelchair sat on a new $115,000 FieldTurf playing surface that glistened in the morning sun, compliments of league benefactors, which include former Rays manager Joe Maddon's Respect 90 Foundation. "Why wouldn't you want to help do this?" Maddon said. Now it's done. The old field, hexagonal rubber tiles that were frayed and coming apart, is gone. The new field took time to complete, with a few delays, causing the league to cancel its fall season. But spring has sprung, and with it baseball for anyone with a dream. Getting to first base never looked so beautiful. MONICA HERNDON | TimesMadison Morris, 5, plays with her brother Zackary Morris, 15, after running home. Head for this ball yard and feel your face shine. There were Opening Day ceremonies last Saturday at the new field at Walter Fuller Park, near the corner of 30th Avenue North and 75th Street North. There was a police honor guard. Dignitaries included St. Petersburg mayor Rick Kriseman. Walker, who got the first hit in the history of the league, sang the national anthem, slightly off key but all Matty, all heart. He also oversaw the ribbon cutting at home plate. And then there was baseball. Everyone bats in the Miracle League. Everyone gets a hit. Everyone gets on base. Everyone scores. The game is always tied. Every season is a winning one, unlike the league's counterpart at Tropicana Field. The Rays organization has always lent a hand to the Miracle League. Its two teams are Rays Blue and Rays White. The lineups included dazzlers from Aiden to Zackery, from Aiden to Cayden to Jordan, from Justin to Matthew to Marissa to Tristen. Everyone reached safely, even if their plastic bat didn't touch the rubber ball. It was no miracle. Volunteers helped. And if by chance you wander onto the field, the fielders will find you and embrace their new friend. You'd better get your hug on. "These kids do more for us then we do for them" said Whitney Johnson, a designated pitcher for Saturday's game. "Their ability to play baseball does amazing things for their self-esteem," said George Stone, the league's general manager and foundation president of Kiwanis of Gulf Beaches. Stone also does the public address announcing at the game, which last two innings. "We've had kids get up out of the chairs and walk. We had a child who had never talked start telling jokes. It really happens." Some kids have been in the league for years. There was a void when the field was unplayable last fall, said Pattie Daggett, whose 12-year-old daughter, Delaney, who has a muscle disorder, plays in the league. "We were worried," she said. "But when George (Stone) called us to say that Joe Maddon and a few other people had stepped up, my heart filled with joy. … Delaney is nonverbal, but she gets happy when I tell her it's baseball Saturday. It's more than a baseball league. It's more like a family." Why wouldn't you want to help do this? Maddon's foundation provided $55,000 toward the field. Another $50,000 was donated by Cal Ripken's Cal Ripken Sr. Foundation. The remaining $10,000 was donated by the Clearwater for Youth organization. For Maddon, it was as simple as 9=8. "It needs to be done. It has to be done," said Maddon, who still has a home in Tampa. "We have to pay attention to these kids and provide an outlet for them, It's vital in any community. I don't believe we think enough about this." 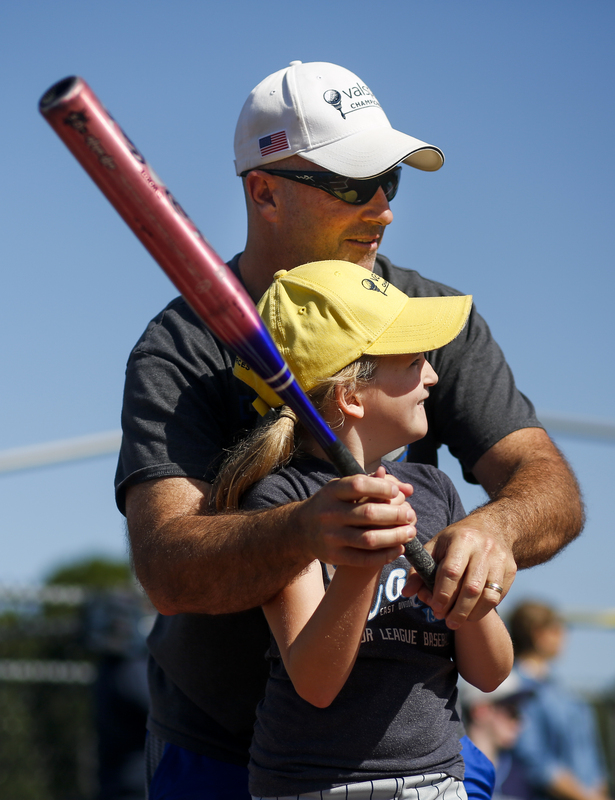 "I know there are kids in the area who'd love to do this who don't even know we're here," said Rick Vaughn, Respect 90 executive director and longtime Miracle League volunteer. By the way, there are kids named Carlos and Jaden in this league who can really rake. Good huggers, too. The Miracle League is back. It will stretch into summer. There is a game this Saturday. Matt Walker, perpetual motion machine, will concentrate on a weekly media blitz to drum up support and fans. The facility could use a handicapped rest room, and an asphalt parking lot, and maybe lights for night games. "We have to dream big," Matt said. MONICA HERNDON | TimesJordon Beyer, 13, runs home during the Miracle League opening day on April 14, 2018 at their new field in St. Petersburg, Fla.
"Maybe not the competition so much, but for the passion of the game," Maddon said. "They're all kids playing the game. Kids want to play. Like major-leaguers, these kids want to play like everyone else, play like their dads played grandpas played." So, on a baseball Saturday, a baseball family got its licks in. Delaney Daggett went 2-for-2 in the game. She came around both times to score. After, everyone posed for a family photo at home plate and signed the ribbon Matty had cut. I think the final was 38-38. We all could have used it.